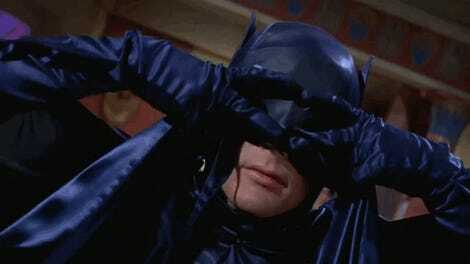 Still from a May 1967 PSA featuring Adam West as Batman. 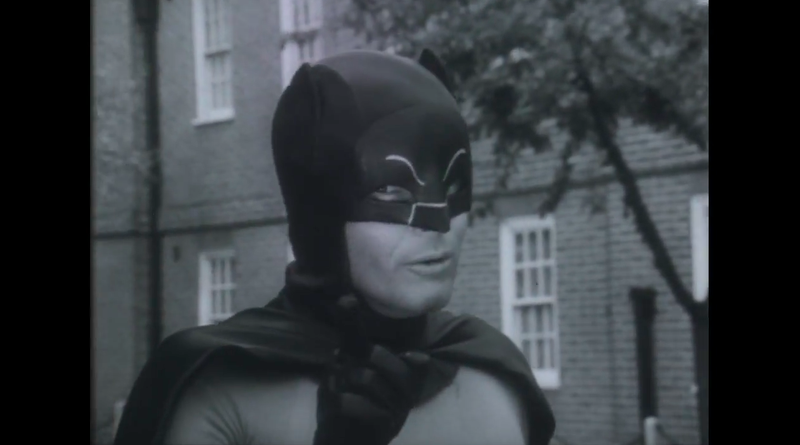 If you’re a fan of the 1966 Batman show, the first thing that will hit you as you watch Adam West in this retro PSA is a strong wave of nostalgia. There he is, smooth as a silk Bat-cape, purring through his lines about pedestrian traffic safety. But, by the time the clip ends, things feel unexpectedly weird. The long-lost 1967 Bat-commercial got unearthed as part of a program to help recover oddities and missing episodes from old British TV shows. It’s standard “look both ways” fare and West runs through the whole thing with aplomb. But a shot at the end gets held a little too long, creating an awkward moment that just leaves us with questions. Sure, a superhero just helped you cross the street and scooped you up in his arms but how safe are you? How safe are any of us in this cold unfeeling world? Riddle me that, Caped Crusader. Riddle me that.